This article will guide you to resize Western Digital hard disk on Windows Server 2008 so that you to aresize partition Windows server 2008 without repartitioning disk. Download IM-Magic Partition Resizer Server to redistribute Western Digital hard drive when disk partition runs out of disk space on Windows 2008. WD hard disk is one of the most famous hard drive brands in the world. During usage of WD hard disk, you may encounter different kinds of problems, while one common problem is that WD hard disk partition is running out of disk space. If Western Digital hard disk partition runs on low disk space on Windows Server 2008, you can resize the hard disk by using IM-Magic Partition Resizer Server which is professional partition software for Windows Server users. This partition software enables you to resize partition Windows server 2008 without repartitioning or reformatting. Download, install and run IM-Magic Partition Resizer Server. Right click a partition that has much free space on the same WD hard disk and then click "Resize/Move" option. You need to move the unallocated space close to the partition that runs on low disk space. 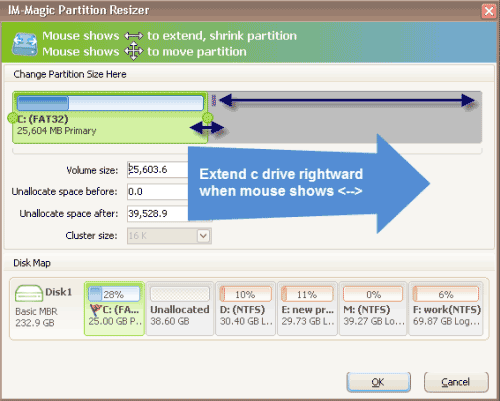 Then, right click this partition and go to "Resize/Move" option. "My 160GB WD hard disk runs on low disk space on C drive on Windows Server 2008. I realized that there is only about 40GB space on C drive now with less than 1GB free space. There are another two partitions on the same hard disk, while D drive has about 20GB free space and E drive has about 28GB free space. 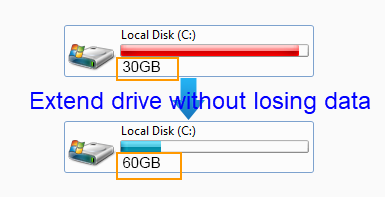 I am wondering if I can move some free space from both D drive and E drive to extend C drive. Can anybody tell me how can I resize the WD hard disk without touching any original information on the hard disk?" "I need to redistribute hard disk on my Windows 2008 computer. The hard disk is Western Digital which has low disk space on system partition. So I want to resize the hard disk and reallocate some free space to the system partition. Please tell me if it is possible to increase size of system partition without reinstalling system." The easiest way to resize WD hard disk on Windows Server 2008 is to rely on partition software, with which you just need to perform a few mouse clicks so that you can easily reallocate disk space without touching any information on the computer. IM-Magic Partition Resizer Server provides a safe and convenient way to resize any brand of hard disk when you encounter low disk space problem on Windows Server. This partition software can help fix low disk space on C drive system partition on Windows Server or increase size of data partition without deleting or moving any data from the hard disk. Running out of disk space on VMware disk on Windows Server 2008? Don't panic! IM-Magic Partition Resizer Server also enables you to resize VMware disk on Windows 2008 and other Windows Server operating system. This partition software can work on VMware disk to resize the partition. With help of this partition software, you can fix the low disk space problem in VMware environment without reinstalling the virtual machine or repartitioning the hard disk. Whether you want to resize a NTFS partition or FAT32 partition, this partition software enables you to resize the hard disk effectively and efficiently in a short time. By using this partition software, you can resize hard disk without rebooting your PC. Another solution for Windows Server 2008 partition resizing is to run Windows built-in Disk Management. You can open the Disk Management and then you can see all partitions on the computer. What you need to do is to select a partition which still has free space on the same WD hard disk. Then, you can right click this partition and choose "Shrink Volume" option, with which you can get some unallocated space from the selected partition. If you want to add the unallocated space to the partition that runs on low disk space, you need to move it close to the partition. The unfortunate thing is that Disk Management is unable to move a partition. If the unallocated space is not adjacent to the partition you want to extend, you will be unable to extend the partition.